AmberIT began as a small dial-up and radio link provider. It has since grown to become one of the leading IT service and solution providers in the country. A part of Amber Group, a conglomerate comprising of 20 companies across diverse industries, AmberIT provides a host of different services including Internet, data connectivity and IP phone, among many others. Playing a central role in the organisation’s continual growth and dynamic diversification, Mohammad Aminul Hakim, the CEO of AmberIT, has been with the company since its inception in 1997. 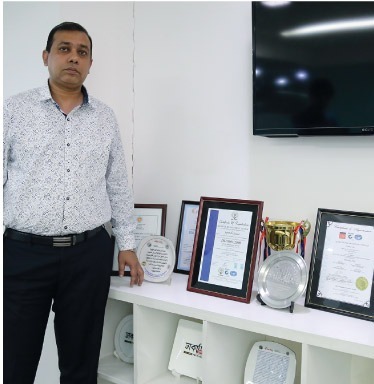 In addition to being at the helm of AmberIT, Mr Hakim is also the current president of Internet Service Providers Association of Bangladesh, a clear recognition of his leadership abilities and knowledge from his peers. AmberIT began as a small dial-up and radio link provider. It has since grown to become one of the leading IT service and solution providers in the country. A part of Amber Group, a conglomerate comprising of 20 companies across diverse industries, AmberIT provides a host of different services including Internet, data connectivity and IP phone, among many others. Playing a central role in the organisation’s continual growth and dynamic diversification, Mohammad Aminul Hakim, the CEO of AmberIT, has been with the company since its inception in 1997. 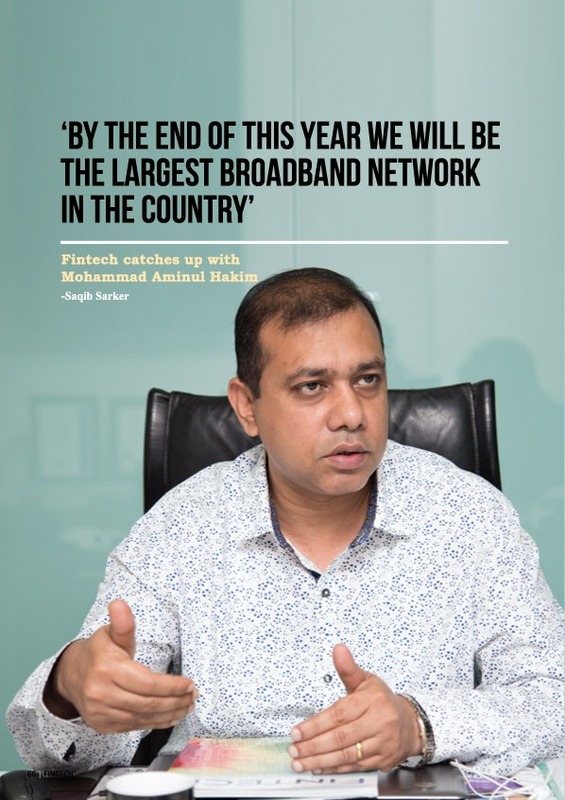 In addition to being at the helm of AmberIT, Mr Hakim is also the current president of Internet Service Providers Association of Bangladesh, a clear recognition of his leadership abilities and knowledge from his peers. Taking over an hour out of his incredibly busy schedule, Mohammad Aminul Hakim sat down with Fintech at the corporate head office of AmberIT in Navana Tower, to talk in detail about the company’s journey from a small startup, the challenges in the industry, policy issues in the ICT sector in Bangladesh, and the future of AmberIT in the coming days among other important topics. 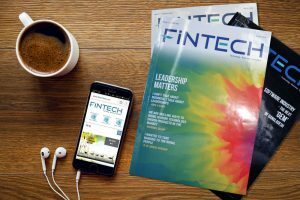 FINTECH: Could you start by taking us through the founding of AmberIT and its journey to where the company is now at? Also please tell us about the situation of ISP in Bangladesh at that time. MAH: We started out as Dhaka Com Ltd in 1997. When we started Bangladesh only had the ‘dial-up’ technology. We didn’t have DSL, ADSL, FTTH, wireless and broadband connectivity. There were two kinds of dial-up; one was a ‘no use, no pay’ connection and the other one was ‘unlimited’. The unlimited line cost four or five thousand taka monthly. Near the end of 2003 we implemented the DSL technology. The DSL is sort of like broadband connectivity. Bangladesh got connected to submarine cable in 2005. Before that we were connected to VSAT. When we were connected to VSAT the international Internet bandwidth cost was very high. When we used the DSL connectivity the demand on the user end was 64 or 128 kbps. Fiber optic technology was introduced in 2004. Some companies had worked with fiber optic connection before, but not in a broad scale. Those were used only to connect major points. Anyways, when Bangladesh got connected to fiber optic cable in 2005 it brought about a huge change for the Internet service providers (ISP). In VSAT, we paid four hundred and fifty thousand to five hundred thousand for per mbps upstream. When the submarine cable came for the first time BTCL, formerly BTTB, set the price at Tk75 thousand plus VAT per mbps. The demand for bandwidth increased in the corporate houses. At the beginning it was point to point connectivity. So, two offices would be connected by a single core fiber. After that FTTH or ‘fiber to the home’ was introduced. So, gradually we had moved from dial-up to DSL to FTTH. In 2015 we changed Dhaka Com Ltd to Amber IT Ltd to eliminate any potential discrepancies or confusion, as Amber was our parent company. From 1997 to 2017, we have come to include many different technologies in our range of services. So, our business started with the Internet. And then we started data connectivity business, which includes ATM machine services. When you withdraw cash from an ATM, that machine communicates with the bank head office. This is called data connectivity. The data connectivity changed the nature of the business, because previously the ISP companies used to operate in limited areas; some in a metro zone, some in a district etc. Data connectivity changed that. For instance, if Sonali Bank has five thousand branches, including in remote places, then to cater to their needs, the ISP companies reached these five thousand locations. That’s how ISP companies started to expand beyond Dhaka after 2005. That’s when we launched other services. When Internet penetration started to grow, and number of clients grew with that, other issues started to surface. When Internet banking started, that automatically prompted the demand for security products. FINTECH: How did you respond to that? MAH: Many different types of work emerged. So, for instance, you get an ISO 27,000 level work, or a CBS was purchased by a bank and now they need to test how secure is that, or a bank adopts a new policy and that necessitates some customization in the CBS, which requires further testing to check if there are conflicts with previous coding. That requires CBS penetration testing, network configuration and network penetration testing and so on. So, we started providing these services. Now we provide network penetration testing, software penetration testing, and ISO 27,000 for banks. 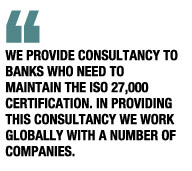 We provide consultancy to banks who need to maintain the ISO 27,000 certification. In providing this consultancy we work globally with a number of companies. So, we work collaboratively with the Trust Web in the US, we work in partnership with Yeati in Bangalore, India, and we work in partnership with Next Target in Malaysia. FINTECH: Could you elaborate on why you have these partnerships? MAH: We do this for a very good reason. You have to remember that when a new service or product comes in Bangladesh for the first time, that is not the first time for many other parts of the world. In other words, even if we don’t have experience in a particular service or product, others do. So, they have the right human resources and their domain knowledge is rich. The best thing about this is that we get the best experts in each individual field. So, for instance, Trust Web has particular expertise in a number of security products, specifically, they are expert on web access firewall. Yeati Consultant, on the other hand, has vast experience in CBS within the Asia region. Next Target does all of the security work of Malaysian government’s telecom operators. FINTECH: Could you talk a little more about the mechanism in how you deliver the CBS related services? MAH: When a bank buys a CBS software or float a tender they have particular requirements about what features they need. A foreign software vendor places the bid, wins and delivers the software. The IT department in the bank do not have sufficient time to properly test the software to verify if it has those required features, modules etc. You cannot find out the problems until you go into full operation with the software. So, in light of this practical problem we brought a software that can check if your CBS fulfils your requirements by carrying out auto-penetration tests. It will find out if the software has bugs or backdoors etc. Secondly, all business policy changes. That doesn’t mean you have to change the CBS every time there is a policy change. When a policy changes the bank informs the vendor that it has adopted a new policy or launched a new product and that has to merge with the CBS. This sort of customization is all about coding. The most common problem associate with it is that an existing feature might stop working or malfunction. The bankers cannot find this out immediately. It is often the case that the problem appears a few months after the customization. In the more experienced industries they carry out a penetration test after every customization, so as to determine that all of the existing features are functioning properly. So, our consultancy involves providing technical support and sales support using our imported software. We ensure that the existing CBS is fulfilling all the requirements. FINTECH: You started IP telephone service and you were planning to develop and market contents through your product. What happened to that? MAH: We started the IP telephone service in 2010. We call it ‘IP Telephony’. IP phone, as you know, is an Internet protocol based communication system. This needs Internet connection, obviously. So, with that connectivity you could do hardware based or software based communication. The hardware based communication would be using a telephone set and software based would be using an app in mobile phones. But you can have a dialer on your laptop or desktop computers as well. One of the barriers for IP phone is that Internet connectivity is mandatory, whereas it is not necessary for PSTN (public switch telephone network). We are a little behind because of that aspect of the service. On the other hand, the maintenance, investment, deployment for PSTN or circuit switching networks are always high. IP based communication has a low deployment and maintenance cost. That’s why we could offer voice communication for a lesser cost than PSTN or Cell networks. That is the essence of IP Telephony. Bangladesh has six and a half crore Internet users. Among them 6 crores are telecom customers or 3G customers. If we want to provide these 3G users with our service, then we will have to deploy a software in the users’ mobile phones. This is being restricted by the BTRC through a directive, whereas, Whatsapp can operate in Bangladesh, Facebook messenger service is permitted, Viber is permitted. All of these allow voice communication. I find it quite tragic that we, as a local organisation, cannot launch the same service that foreign organisations are permitted to do. What is the logic behind it? There is none. Someone from America can come to this country and launch their product, when my own government will not give me the same opportunity. I don’t understand this policy. It is certainly not an issue of national security. If it was we would have readily admitted it and accepted the government’s position. Another matter is IP TV. We are also restricted to provide IP TV service. We are also barred from providing OTT (over the top) applications. But YouTube, which is an OTT service, is permitted in Bangladesh. If we can’t deploy OTT service, then why does YouTube have the privilege? Another interesting thing is that you have to get a license as an ISP business from BTRC. If you want to provide a service like YouTube then you do not need license from BTRC. If I decide to develop contents, then I cannot deliver that to customers because I am licensed as an ISP business. If you are not a BTRC licensee, then you are free to provide whatever service you want. But that stops if you are an ISP, which is an absurd policy. I think the policy makers should rethink the whole situation. Another challenge we face is that we get a lot of the blame for the overhead cables. But it’s not just us who are cluttering up the space. PSTN, cable TV are also responsible for this. But the sad thing is that we now have the technology to provide ‘triple play service’ through one cable – data, voice, video all through one cable. That means if we now have three cables overhead for PSTN, cable TV and ISP, we can reduce that to one cable. This is called the ‘triple play service’. If you want to provide that service, then you have to have the permission to provide video to the ‘last mile user’. But the BTRC directive prevents us from doing that. Most importantly, why shouldn’t we take the advantage of the latest technology? If you think about the costing alone then this will be a lot cheaper because using one cable instead of three will minimize my operation cost. And this will ultimately benefit the general public who will reap the benefit of the reduced cost. Let’s say you are paying Tk500 for cable, Tk1000 for the Internet and Tk500 for voice; a total of two thousand taka. When I can reach you through a single probe I don’t have to bear the maintenance cost for two other cables. So, instead of two thousand taka, you will have to pay, let’s say, 15 or 18 hundred taka for the same service. Even if you save three hundred taka that is a big amount, nearly 15 percent. 15 percent cost cutting is huge in this market and the last mile user (retail end-user) is benefitting from it. There is no reason for the government to not want this . FINTECH: As you grew from a startup to this big company, what kind of human resource challenge you have faced when you started and what is the situation now? MAH: I started out as technical officer at Dhaka Com. After that I worked as the system administrator. After that I worked for a while as the system manager. From there I went on to become the chief technical officer and finally in my current position as the chief executive officer, which I have been occupying for the last seven or eight years. So, for me personally, my beginning was in the technical field. And then I moved to techno-management, naturally. The Internet business started in Bangladesh in 1996. There was a crisis then when ISP first became available in the country. There wasn’t any local expertise for ISP set up. Expert help from Singapore used to come in then to do the set up for us. In around 2001 the situation changed completely. From 1996 to 2001 a huge number of human resources were built up for the ISP industry, particularly at the system administration level. After the year 2000 no foreign expert was needed to carry out any kind of set up work in Bangladesh. From 2001 to 2005/6 we created local expertise of international caliber. Since 2006/7 local experts started going abroad to train others. If you consider the changes I just described, it is a big success. At one point we couldn’t do anything and we needed experts from Singapore to come and do everything for us. Within five years of that we developed expertise of international standard. They even surpassed the normal expertise. Many trainers from Bangladesh are going to India, Pakistan, Sri Lanka and other places in the Asian region to provide training. There are some difficulties that we did face and are still facing. In Bangladesh expertise in IP communication were developed exclusively by the ISP sector. When the telecom operators reverted to the IP backbone they took away a lot of the human resources from our sector. They did not build their own human resources. The same thing happened when the baking sector took human resources from us, as they had no programmer for training their own people. FINTECH: Do you think young candidates prefer going into telecom and banking, rather than coming into your sector? MAH: Yes, and one of the reasons they were able to do this is because working in multi-national companies is still considered more prestigious in our society. So, the new people coming into the job market prefer the banking or the multi-national company jobs. They do not think about what difficulties they might face later. So, a lot of people switched from our sector to telecom and banking. Consequently, we lost competent people. Also if you think about the ICT sector, you could fragment it into four main categories. One is the ISP business. The ISP mainly entails an infrastructure, system administration, routing, switching. 99 percent of our daily routine work involve these; ensuring the routing, making sure the routing table is updating correctly with the upstream, if the total network working smoothly and so on. Another part of the ICT is the software industry. They work at the programming or coding level. And then call centres, system integration, solutions etc fall into the third category of the ICT. And then there are hardware work, which would fall into the fourth another category. They import hardware and provide solutions. So, you can work in many different areas within the ICT sector. What we have been seeing recently is that young aspiring candidates look to get into the software industry. This is a challenge as they do not want to come into the networking side of ICT. Also, a good percentage of CSE graduates are female students. Female candidates are typically very reluctant to build their career in the networking sector. So, our industry loses a significant chunk of the potential workers before the recruitment process starts for these candidates. The generation before me used to seek government jobs. My generation got out of that mentality and started doing private jobs. People of the current generation are more keen to doing something on their own, instead of going into service. I’m talking about the people who have technical knowledge. So, overall there is a lacking in the human resource department. FINTECH: How are you dealing with the situation? MAH: We are trying to overcome this problem. One of the ways we do this is training the people we do get. The trainings care carried out by the joint efforts of the industry. From ISPAB (Internet Service Providers Association of Bangladesh), we conduct at least seven or eight programmes all year round. These training are core technical trainings. For example, we will start a five-day-long training programme on May 19, where we will conduct three different training courses simultaneously. This will be held in Bagura. The purpose is to bring in the workforce out of Dhaka under the training stream. Hands-on training will be provided by local experts as well as foreign trainers. There will be conferences to facilitate knowledge sharing. In March last year we conducted a training on cyber security, where we had about 80 participants. This is a continuous process and we are doing them constantly. We even carry out awareness programme at the school and college level, so that these students feel interested to later come into our industry. I think the responses have been positive. A great thing about our industry is that once someone stays for about six or seven years, they do not switch industry. I think this is an achievement of the ISP industry. FINTECH: What is Amber IT focusing on now and what are your future plans? MAH: Even though we take all of our products seriously, our main focus right now is cyber security or information security for the banking sector. Data connectivity and IP Telephony are getting equal importance as well. We do network deployment or network restructure as our routine work. May be this year we will have 10G backbone somewhere and we want to convert that to 100G by this year and so on. For our connectivity service, the plan we have for this year is simply to expand our reach. Since March last year we have been operating in Sylhet and we are providing home connection there. From May 1 we are going to be expanding this to Khulna. And by the end of this year we will be providing connection to ten more districts for home users. Other than Khulna and Sylhet, we will reach Chittagong, Cox’s Bazar, Rangpur, Bagura, Rajshahi, Barisal, Jessore and Comilla. We will bring these zones under broadband connectivity. We have already covered 62 districts, out of 64, for corporate connection. But this is for home users. I think the most notable achievement will be to be able to officially declare at the end of this year that we are the largest broadband network in Bangladesh. If we expand our offices in ten districts, then that will cover 27 or 28 districts. Connecting 28 districts to one single network is a huge task and we are hoping to get it done by this year. FINTECH: Thanks very much for speaking with us. MAH: Thank you for talking to me.